There’s nothing better than relaxing with family and friends around your own private fire pit. It’s a wonderful landscaping accent that is both highly enjoyable and usable. A custom built fire pit can serve as a visual accent from the house whether it’s designed as a cove of rock retaining blocks or built of large accent boulders. Or do you prefer a contemporary fire pit complete with a deco sitting wall and glass fire bowl pieces? No matter what kind of fire pit design you have in mind, we can help you make that idea a design reality and then build it for you. 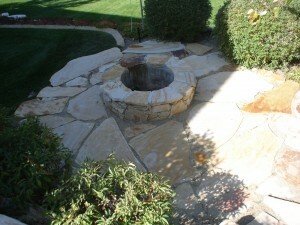 We can even help you accent your fire pit with hardscape pavers or a flagstone path to your private retreat. Pebble Creek Landscaping has 20 years of experience in Utah building custom fire pits and the custom upgrades that take your landscape to the next level. You’re ready for your custom dream landscape today – contact our specialists in the Draper area today for a FREE design consultation. We guarantee you’ll love the results and the affordable price.